Langdale Hotel and Spa Country House HotelThe Langdale Hotel & Spa, set in 35 acres of woodland and waterways in the heart of the Lake District, is the perfect place for getting away from it all. Massive millstones, a water-wheel, cannon and other relics are reminders of its former life, as a 19thC gunpowder works. The majority of the 56 bedrooms are located village-style, in historic properties around the estate, with just 5 situated in the main building. Each room is different in style with Feature and Ultimate rooms for those special occasions. All rooms are en suite and are equipped with satellite TV, direct dial telephone and tea/coffee making facilities. The exclusive Country Club's central feature is the 20m indoor pool, with bubble massage seat, dedicated swimming lane, spa bath and fully-equipped exercise studio. The health & beauty salon offers a full range of treatments for head-to-toe pampering. You are assured of a warm welcome and friendly service on the award-winning Langdale Estate. From 14th October 2015 Purdeys Restaurant and Hobsons Bar will close to make way for Stove Restaurant and Bar opening in January 2016. The Terrace Restaurant will be open as usual and the menu will be extended to include the most popular dishes from Purdeys and Hobsons. There will be some visual impact and access through these areas will be restricted. The leisure and spa facilities are unaffected. 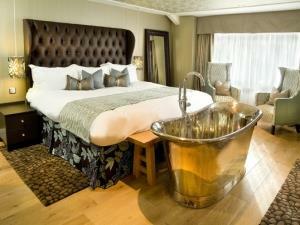 Langdale Hotel and Spa sometimes limits bookings to 2 or more days. Colours, textures and images inspired by Lakeland these rooms larger than their cosy neighbours with the same amenities. Roomy Signature sometimes limits bookings to 2 or more days.